Send us a mail and we will get back to you. Our Pretoria training venue is conveniently located in the heart of Pretoria, namely Arcadia. The venue is easily reachable by public transport and offers easy access to ​various restaurants to satisfy catering needs of all tastes and preferences. 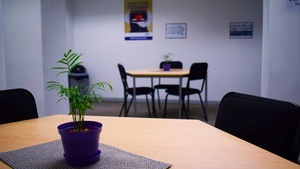 All training rooms have seating and tables for learners which can be moved to suit the training requirement. A desk and chair for the facilitator and two flip chart stands are also available in each room. Our Tearooms have seating available, with Coffee, Tea, mugs, Urns and Microwave facilities for convenience of you and your delegates. ​Our attention to detail and great customer service makes our venue inviting and creates a learner friendly environment. We offer several breakaway rooms to enhance your training experience. ​Please ​inquire for our full range of options. We can arrange catered wholesome meals with beverages on your behalf. ​Please ​inquire for our full range of options. We can arrange fast food take-aways on your behalf. Please inquire for our full range of options. ​We can arrange platters with a selection of cold meats and snacks on your behalf. Please inquire for our full range of options.